Owen Ogletree's past ON TAP beer articles for Athens Magazine. Examples of some really unique beers. These beers are unique and bizarre. Over the past 20 years, American beer experienced an exciting metamorphosis. Modern craft brewers revel in experimenting with a fascinating array of imaginative ingredients, conditioning methods, brewing procedures and fermentation microorganisms. This article summarizes just a few of the most exciting and strange new brews available in the Athens area. 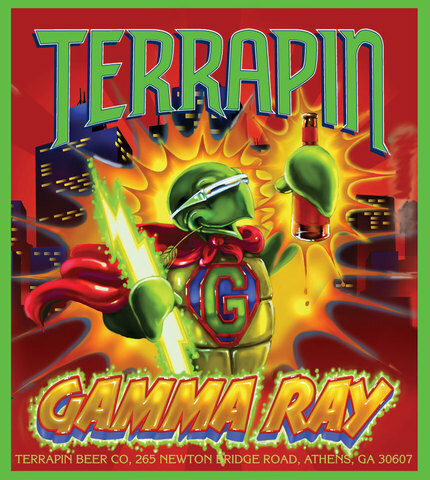 Gamma Ray, Terrapin Beer Company's special "Side Project" beer for spring/summer, explodes on the palate with overtones of wheat and Tupelo and sourwood honey from Savannah Bee Company. At 11% alcohol, the memorable Gamma Ray ranks as the most potent beer to emerge from the Athens microbrewery. Dogfish Head Craft Brewery in Delaware researched and duplicated an ancient Turkish fermented beverage recipe from residue found in 2700 year old drinking vessels discovered in the tomb of King Midas. The result is Dogfish's Midas Touch - a strong, moderately sweet ale with elegant honey, saffron and tropical fruit notes. In the heart of Germany's Gothic town of Bamberg sits the personable Schlenkerla brewery tavern that dates back to the 1400s. Schlenkerla persists in the medieval practice of using malted barley dried over an open beechwood fire. Smoke permeates the grain, and the resulting dark lager beer presents surprising aromas and flavors of smoke and barbecued ham. Rogue Chocolate Stout from Oregon and Young's Chocolate Stout from England both employ bittersweet chocolate extracts. Slightly sweet malt blends with rich cocoa notes, producing delightful beers to accompany ice cream, cheesecake or fruit tarts. The first Wednesday of each month marks the tapping of a special cask of experimental ale from Matt Buley, brewer at Copper Creek in downtown Athens. These ten-gallon serving casks allow Buley to incorporate extraordinary ingredients in his beers such as wood chips, vanilla beans, spices and even herbs and chili peppers. For certain beers, wood is definitely good. Fermentation vessels, handmade from ultra-dense Paraguayan Palo Santo wood, impart pleasing vanilla, tannin, caramel qualities to Dogfish Head's Palo Santo Marron strong brown ale. Also appreciating the complexities that wood imparts, the UK's famed Harviestoun Brewery matures their Ola Dubh in Highland Park single malt whiskey barrels. The result is strong, dark ale with impressive vanilla, espresso and peat smoke qualities. Hops (aromatic flowers grown on vines) provide the bittering spice in beer, and American craft brewers have recently gone wild for hops. Flying Dog's Double Dog Double IPA and Lagunitas Brewery's Hop Stoopid both pack an extreme quantity of hops that wallops the drinker's nose and tongue with citrusy, spicy aromas and lingering, decadent bitterness. Ancient brewers knew nothing about yeast and employed whatever local microbes settled into their fermenters. A few modern beer producers explore this antiquated practice by including a range of interesting fermentation yeasts and bacteria. Ommegeddon (from Brewery Ommegang in Cooperstown, NY) is an intriguing 8% alcohol Belgian-style ale using wild yeasts to provide a slightly funky, earthy, mineral-like character. Michigan's Jolly Pumpkin Brewery utilizes open fermenters and wild microorganisms - manifesting a tart, fruity, spicy and complex range of artisan ales. Lagers normally ferment at cold temperatures to produce clean beers with no fruity yeast notes, but Sweetwater's seasonal Road Trip pilsner-style beer throws in a twist and turn from warm fermentation that increases fruity aroma and flavor complexity. Road Trip's availability only runs until the end of July in local pubs, retail stores and in Sweetwater’s popular brewery tour tasting room in Atlanta. Of course, some beers defy any connection to brewing orthodoxy. Synesthaesia is a powerful, 14% Belgian-style red ale brewed and served at 5 Seasons brewpub in Alpharetta, GA. The beer includes cane sugar, turbinado sugar, oven-toasted grains (to provide a bready, nutty character), a huge addition of spicy aroma hops, and even a touch of wormwood (a tarragon-like herb used in Absinthe). Are these strange brews preposterous novelties or creative works of brewing art? Be adventurous, taste a few and come to some delicious conclusions.